I had too much fun this week, making this 4" x 6' framed light up art piece using new Essentials by Ellen Leaping Deer die and Season to Sparkle stamp and die sets, along with Chibitronics Chibi Lights! 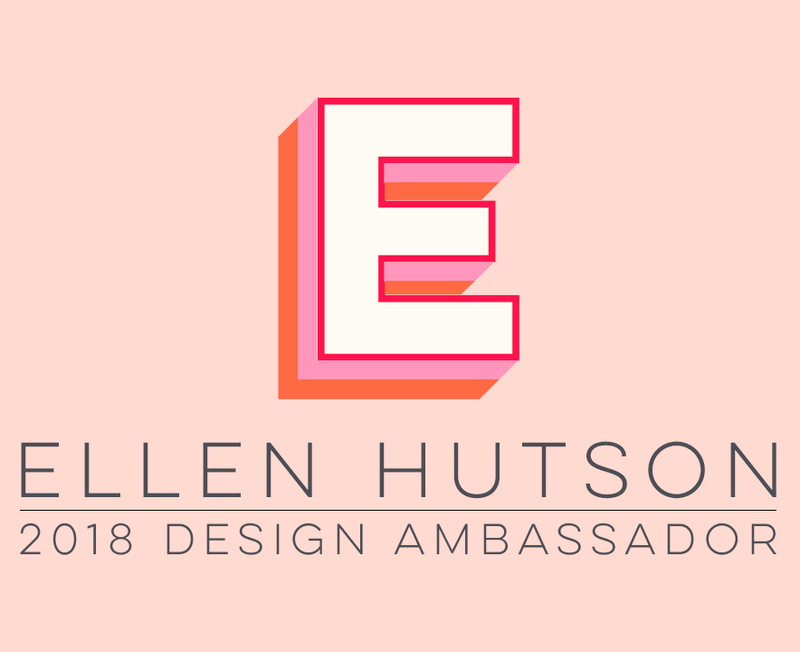 Head over to Ellen Hutson's the Classroom for all the details! I started by stamping the image onto a white Inchie Arts 4-inch Art Square with Memento Tuxedo Black ink. Next, I colored the foliage with Copic YG61 and YG63. I like having an assortment of Multiliners on hand to add pattern, doodles or to fill in lines of a stamped image that may not have stamped 100%. I also used a Sepia Multiliner to color the branches of the foliage (shown below), as well as the soles of the ice skates. Lavender was also used to color in the Merry Christmas Oval sentiment. These are the Copic markers and Atyou Spica Glitter Pens I used to color the rest of the image. The N's and T's were used to create a ground shadow. The C's were used on the white shoes and blades. Clear Atyou Spica Glitter Pen was used over the Lavender Multiliner berries; and Silver Spica was used to color the eyelet lacing holes. To finish the piece, I used an Essentials by Ellen Stitching Lines die to emboss faux scalloped stitches into the Art Square along the top and bottom. Then rows of clear gemstones were added below and above the stitching. To build up the dimension of the skates, I colored and cut out another skate and popped it up on X-Press It Foam Tape, over the front original skate. I love the dimension this gives the piece! Finally, I placed the finished Art Square into a 4-inch white frame, to be displayed during the holidays. This frame is a little too small for my preference, as it cuts off some of the stitching, so I'll be looking for another one before the holidays! Hello, and welcome to the Holiday 2016 Essentials by Ellen Release Hop! I’ll be showcasing several of the new stamp sets and dies on my post today, AND I also get to give away an Essentials by Ellen stamp set, so please be sure to check out the giveaway details below! This card came together quickly by just die cutting the Holiday Words from watercolor paper, silver metallic cardstock, and Bazzill Peppermint cardstock. After splattering my Zig Gold Wink of Stella onto the watercolor background, I simply replaced the PEACE and LOVE die cut words into the background and secured them on the back side of the background with X-Press It Foam Tape. The background was attached with the foam tape to a gold metallic cardstock base, allowing the gold cardstock to show through the JOY word window. The Antlers were intertwined with gold heat embossed and die cut Light Parade lights (colored with R27 Copic marker) and also attached with foam tape at the top, then the base of the Antlers were glued onto the background using Matte Multi-Medium. I loved this beautiful ornament wreath so much, but couldn't decide on my favorite color combo ... so you all get to tell me which you like best! Each wreath was silver or gold heat embossed onto Neenah 110 Lb. Solar White cardstock, then the ornaments colored with Copic markers and bows colored with coordinating Kirarina WiNK metallic markers. Copic markers: G14, YG17-21-23-25, Y06. Each wreath was die cut with its coordinating Homespun Holiday wreath die. Note: the centers of the wreaths are not cut out with the die -- I hand cut them with a craft knife. The colored background panels were die cut with Taylored Expressions Frame-in-Frame 1 die. I love the simple elegance this embossed and die cut frame adds to the cards! The pretty "wish" sentiment was silver and gold heat embossed onto the die cut panels, then mounted flat onto Neenah Solar White card bases. The wreaths were popped up on foam tape. Which color combo do you prefer? The winner may chose ANY Essentials by Ellen brand stamp set (Maximum value $25 USD) currently in stock at EllenHutson.com! To enter my giveaway, please leave a comment on today’s post by Tuesday, October 25, telling me your favorite part of the holidays! There is also a crazy good Grand Giveaway in the CLASSroom! To enter, be sure to leave a comment there, also by Tuesday, October 25! ALL winners will be announced at the CLASSroom on Friday, November 4. Please check there on that date to see if you are a winner and for further details on claiming your prize. You should have come to my blog from the fabulous Julie Ebersole's blog. Your next stop on the hop is the awesome Brandi Kincaid! But before you leave, don't forget to leave a comment here on my blog, for your chance to win! Happy hoppin’ and thanks so much for visiting today! Wishing you all Peace, Joy and Love this Christmas Day! Today I'm over in The CLASSroom with this last Christmas card of the season ... I hope to see you there! Merry Christmas! Roly Poly Christmas & Giveaway Winner! Hi, Friends! With school being out soon for the holidays, I wanted to share a fun project that can be created with/by kiddos that I’m sure they will enjoy making (and keep them busy!). These coasters would make great teacher or hostess gifts, too! So get out your adorable Taylored Expressions Roly Poly dies and fabulous 100% Wool Felt and head over to the Taylored Expressions blog today for all the details and instructions on how to make them! AND, there's a giveaway there, so be sure to leave a comment for your chance to win! I love a lot of the same products as on your list, especially my Big Shot and Taylored Expressions products! My wish list includes the Misti, since I've been seeing so many wonderful video tutorials, and I always want new dies! I'd love to try out the Misti, too! ;-) I've sent you an email, Karen -- If you will respond with your mailing address, the warehouse will get your awesome prize package shipped out right away! Many thanks to the fabulous crew at Ellen Hutson LLC for providing this amazing prize package! Hope you have a great rest of your week! Taylored Expressions has some fantastic new 3”x4” Watercolor Panel packs, which are pre-printed with 12 different designs, ready for you to quickly color and add to any kind of papercrafting project! These fabulous panels combine two current hot trends: watercolor and adult coloring books! You can use any kind of coloring medium you’d like on these heavyweight textured watercolor paper panels, and I combined two different inks – Copic markers and Distress Ink! I hope you'll join me today over on the Taylored Expressions blog for all the details on how I created this Merry & Bright card, using one of these fun new watercolor panels! Fun, right?!! Think washi tape, in gorgeous glittery colors! The "glitter" does NOT come off, and the tape is surprisingly very soft and pliable, and easy to reposition (without tearing or lifting up the paper to which it was applied), if needed! For the delicate and intricate ornament overlays, I used X-Press It's Fine Glue Pen to adhere them to solid cardstock circles -- check out that VERY fine glue pen tip! This is my favorite go-to glue pen for small die cuts -- the glue can either be used as a temporary bond (let it dry a little while before applying a glued piece to another piece of paper) or permanent (apply immediately). And the glue dries clear! The card was finished with silver foil die cut hangers and the smallest and large ornaments were popped up on X-Press It 1/2" High Tack Foam Tape. The beautiful Taylored Expressions In & Out Christmas sentiment was silver heat embossed with a silver metallic sparkle embossing powder, to match the silver Glitter Deco Tape! After the tape was applied, I trimmed the excess from the sides. Now I have a great accent strip to use on another project! Thanks so much for joining me today ... I'm off to start my holiday decorating! Whether we are ready for it or not, Christmas is just around the corner! And with the stores already decked out in holiday cheer, I can't help but get in the Christmas spirit when I see all the pretty decorations! And now you will probably be humming this song, just like I was when creating this card! Isn't this Pink Ink Must Be Santa image the sweetest?!! And with my rekindled love of watercolor, I couldn't wait to stamp it onto and an Inchie Arts 3-inch white Art Square and color it up! I black heat embossed the image and then used Peerless watercolors to color it. This was my first real use (other than testing) the Peerless and I LOVED them!! I used the the smallest Complete Edition set of 15 and it has a really good selection of colors for a beginner to try out -- just to see if you like them and/or they would make a great gift since there is a nice range of colors and at a good price point! The matboard Art Square holds up very nicely to watercolor -- no warping and the colors blend very nicely! After the watercolors dried, I added White Wink of Stella to the white parts of Santa's suit, hat, mustache, and boot cuffs -- hopefully you can see the pretty shimmer in the darkened photo above. To finish the card, I layered the watercolored Art Square onto a Taylored Expressions Postage Stamp die cut from Bazzill Licorice Twist cardstock, tied Peppermint twine around the bottom, and popped the image up on X-Press It Foam Tape. The card front was also watercolored using a brick stencil on watercolor paper. Hi, Friends! Today I have stepped out details on how to watercolor Pink Ink’s beautiful new Angel on High #6108L. So let’s get started! 1. Stamp angel and sentiment with Versamark ink, then gold heat emboss. The embossing helps to keep the watercolor contained on finely detailed images! 2. Watercolor sky with Tumbled Glass Distress Ink, using broad waterbrush. 3. Watercolor angel dress with Spun Sugar Distress Ink, using detailer waterbrush. 4. Add depth to folds of dress with darker Worn Lipstick Distress Marker; blend with waterbrush if needed. 5. Color skin with Antique Linen Distress Marker; blend with waterbrush if needed. 6. Watercolor wings with Fossilized Amber Distress Ink. Concentrate more color under the rows of feathers, to help create depth and accent them. 7. Watercolor hair with Gathered Twigs Distress Ink. Add Spun Sugar Distress Marker to cheek; blend with waterbrush if needed. To finish the card, I trimmed the watercolored panel between the angel and sentiment, and also trimmed a little less than 1/4” off the top of the panel. The panels were separated and adhered with foam tape onto a white card base, with an accent strip of gold foil paper adhered to the card base below the panels. Do you prefer coloring with just markers? Then use these same steps with either dye based markers on plain or watercolor paper, or use your Copic markers on Copic-friendly paper such as X-Press It Blending Card, and I’m sure you’ll achieve wonderful results! Are you getting ready for "the most wonderful time of the year"? This quick and easy watercolor background will have you ready in no time! I hope you will join me today over in the CLASSroom for all the details on how to create this card using Tim Holtz Distress Inks and more of the newest Essentials by Ellen Holiday 2 Release stamp sets created by Julie!